On Friday, Feb. 27, students, staff and faculty members from universities across the state of Indiana gathered in the Hulman Memorial Student Union to participate in Design Interaction Day. Design Interaction Day is a special day dedicated to interior design students, faculty and professionals who get the chance to view each others' work, learn about products and services in their field, and gain valuable information about the business of interior design. 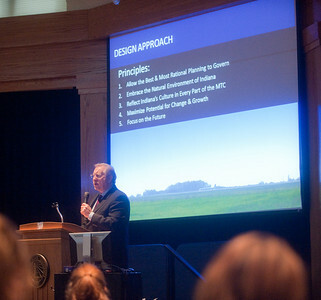 Although the turnout was less than expected, according to Drew Randle, a junior interior design major and student representative to the Indiana Board of American Society of Interior Designers, the lineup of speakers from different niches provided plenty of knowledge and helpful information to those who did attend. The first keynote speaker, Ripley Rasmus, senior vice president and director of design for Hellmuth, Obata and Kassabaum, spoke about the design layout of the new Indianapolis International Airport and all of the work that went in to making it possible. "I like to try and touch as many students as possible," said Rasmus. "I usually speak in order to connect with people." Rasmus specifically spoke about why the designers planned the layout they did. Following Rasmus were a few welcoming words from Indiana State President Daniel Bradley. "Welcome to ISU," Bradley started off. "This event is an example of what Indiana State encourages students to be a part of." Bradley asked the crowd, "What do you do in hard times," before answering, "you work harder." After a break for lunch, the second keynote speakers, Steve Arnold, an architect, and Jodi Goings, an interior designer with MMS-A/E in Terre Haute, spoke about, "The Dynamic Working Relationship between an Architect and an Interior Designer." Lauren Dilley, a junior interior design major at Ball State University, said her favorite part of the event was getting to see all the different companies and speaking with their representatives. With an ever-growing hardship within the economy, the day's events offered some advice on how students could succeed. 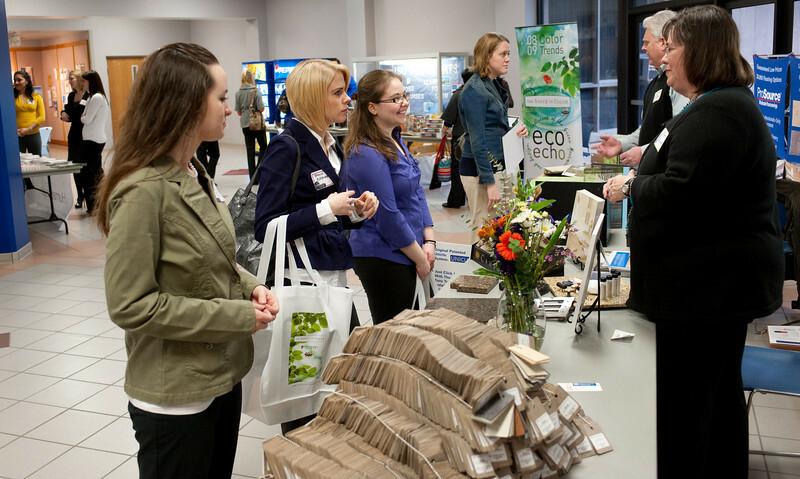 "Design Interaction Day is important because it allows local sponsors and suppliers to educate students on what to expect upon graduation," said ISU sophomore Anna Hollibaugh. Cutline: Ripley Rasmus, senior vice president and director of design for Hellmuth, Obata and Kassabaum, speaks about developing the design of the new Indianapolis International Airport. Cutline: Interior design students were able to visit with company representatives showing different samples and products during the Design Interaction Day.